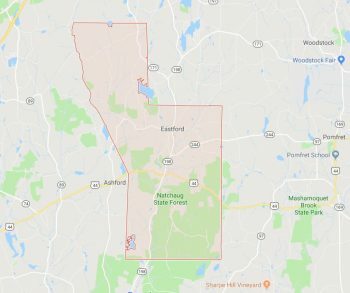 Connecticut only has one zoo, thankfully. 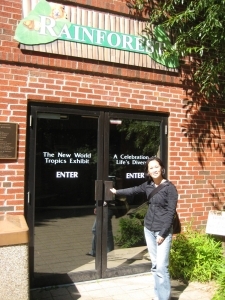 You see, Hoang and I do have ethical issues with zoos – especially ones that don’t go full bore trying to best replicate the animals’ natural environs. 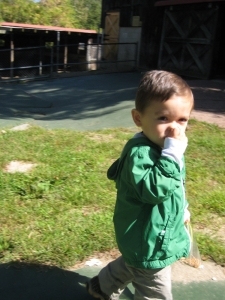 But, on the other hand, we both love seeing animals and really… is there anything better for a toddler than a zoo? 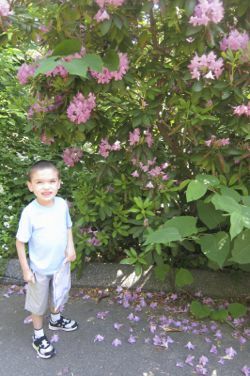 It is sometimes difficult to find things that Damian truly enjoys (due to his Smith-Magenis Syndrome for a couple hours straight. 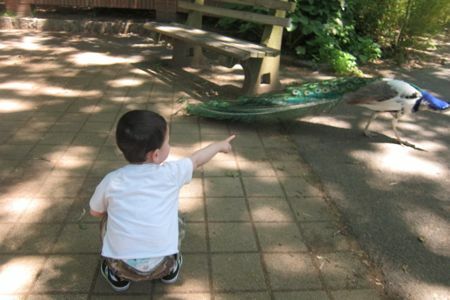 And while he had a few outbursts at the zoo, it was a great trip overall. Even better? We had free tickets once again. Bridgeport is an enigmatic city, certainly not most well-known for zoos and green spaces – and yet, it’s nickname is “The Park City,” a fact many people will find hard to believe. However, my previous visit here a few months prior included a very enjoyable visit to the Barnum Museum and I had heard some good things about this zoo. And, proving once again that I’m the master of the segue, the zoo and Mr. Barnum have a shared past. You see, in 1878, James Beardsley, a wealthy cattle dealer, donated over 100 acres to the city of Bridgeport. Then, in 1884, the city contracted old CTMQ favorite Frederick Law Olmsted to create a design for Beardsley Park. 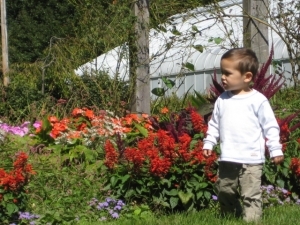 Mr. Olmsted’s plan was to create a simple, rural park for the residents to enjoy. As CTMQ readers know, Bridgeport was also home of Mr. Phineas T. Barnum and his world famous circus. At the time of the Park’s creation, Mr. Barnum usually exercised his animals through the streets of Bridgeport, and it was common to see zebras and camels walking up and down the city’s Main Street. After Beardsley Park was created, Mr. Barnum and the circus company began exercising the animals there. 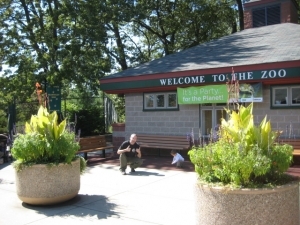 In 1920, Bridgeport Parks Commissioner, Mr. Wesley Hayes, began a campaign to create a City Zoo within the Park. 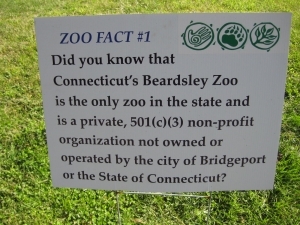 He requested that the citizens of Bridgeport contribute animals to start the zoo. 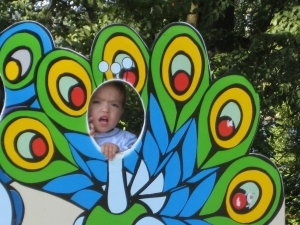 In the first year there were eighteen exotic birds donated. 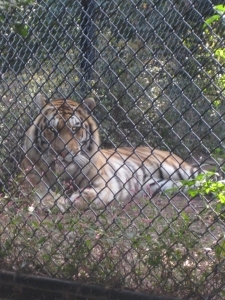 Barnum and Bailey Circus also donated some of their retired animals to the zoo. We passed some buildings which we’d be seeing on our way out later. 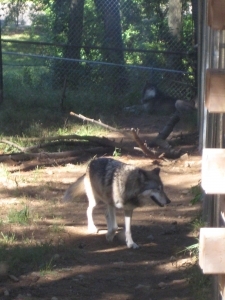 The first animal exhibit after the condor contained a couple wolves. Timber wolves to be exact. We viewed them from the safety of a little explanation hut which contained a ton of wolf related material. It was all rather interesting, but Damian was still figuring out where he was, so it was time to move on. 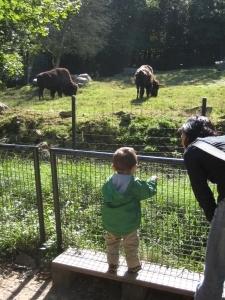 Now at the northernmost point in the zoo, we were a bit startled to see a few large bison roaming the hills. 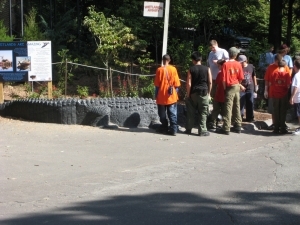 After those guys, we were treated to… a turkey vulture? Yeah, we were. I don’t really know why, as they are everywhere, but seeing him up close was a bit intriguing. This exhibit was also a bit of a letdown. 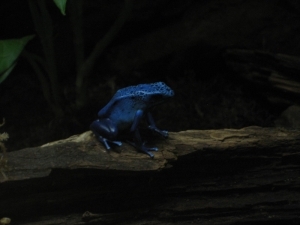 This is a theme here at the Beardsley – relatively common animals on display – as you’ll see in a bit. First it was time for some pronghorn antelope up a dusty hill followed by your run-of-the-mill Andean Bear. 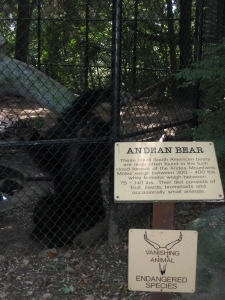 Andean Bear!? Awesome! I suppose this should be added to CTMQ’s official Bears! List. 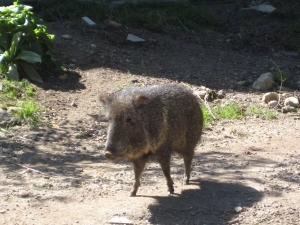 It the only species of South American bear, found in a narrow strip running from western Venezuela through the Andes in Columbia, Ecuador, Peru, and Bolivia, and ending in Northern Argentina. It is the least carnivorous bear species, favoring fruits, berries and roots. As an omnivore, however, the species will also eat the occasional meat. In very rare cases, in some parts of Ecuador, there have been incidents of bears attacking livestock. 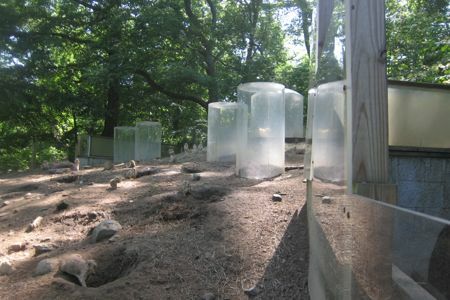 The reason for this is believed to be a lack of food in the forest forcing bears to search for food elsewhere. Once a bear has eaten meat, they often get a taste for it and return to hunt again. As bears aren’t natural born killers like felines, they don’t go for the jugular for a quick kill and easy meal. The bears actually tend to jump on the cows back and take chunks out of the tender shoulder region whilst the cow is still alive. If the cow survives this attack, then they will certainly be killed by the bears immense force shattering the animals skeleton as is dragged back to the cover of the forest. I had to include that last paragraph as the imagery it conjures is just too cool to leave out. 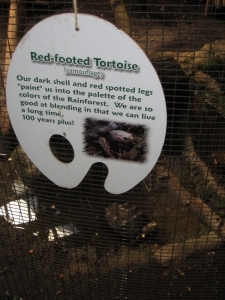 Oh, and they are also a threatened species, as you could have guessed. 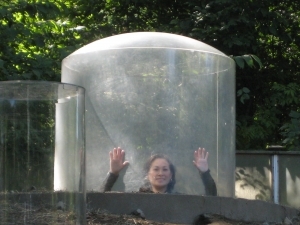 Oh, we’re just getting started… There’s a decent River Otter cage and a Lynx that was hiding from us. 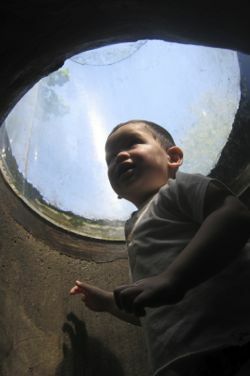 Damian particularly enjoyed the Walk-through aviary which was incongruously followed by the alligator tank. 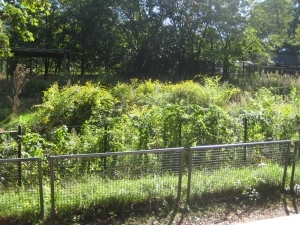 Speaking of aviaries, the entire zoo is one of a sort as 12 peacocks roam the grounds freely – as they’ve done since 1922. 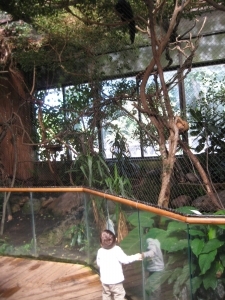 After a jaunt past some foxes, we hit one of the highlights of the zoo: The Amur Tigers! The Amur (or Siberian) Tiger is the largest living cat in the world. 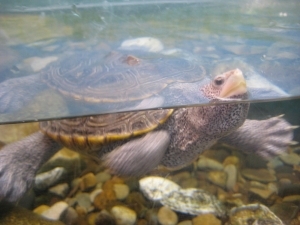 The males can tip the scales at 800 pounds. The name “Siberian” is actually incorrect because these tigers do not live in Siberia but the Russian Far East in the Amur-Ussuri region of Primorski and Khabarovski Krais (States) whilst a few are found across the border in northern China and Korea. Now about halfway through, we took a break for lunch near the Peacock Cafe which is adjacent to the Peacock Pavillion. While just a rumor, I heard the peacock patties are delicious. Just don’t tell the guy above. 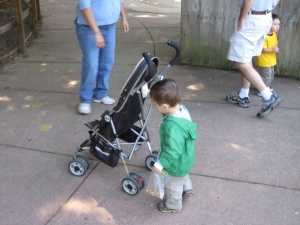 At this point, for some reason, Damian decided he was going to push his stroller for a while, which was cute but also rather slowed us down. Oh well. 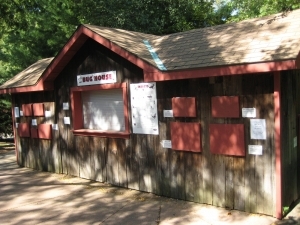 The Bug House was unfortunately closed which we remarked was odd because really… How hard is it to maintain bugs? 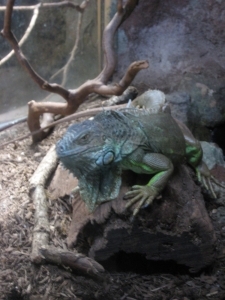 Hmm, nary a picture of a reptile. Oh well. 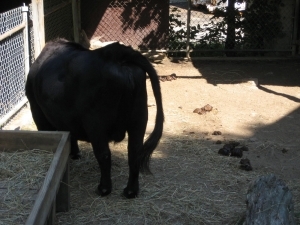 (I taught him that “sign.”) Also in this area were several goats which we deemed, “Ghetto Goats” because of their abhorrent living conditions. I mean really… Do goats play basketball or something? 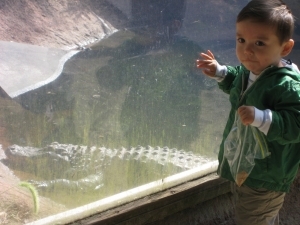 We ambled through the Wildlife Pond again (Damian still pushing his stroller while carrying his cookie bag) before checking out Hoang’s favorite animal of the day: The Chacoan Peccaries. These odd looking creatures were assumed extinct until 1975 when a thriving population was found in cental South America – making them one of the last large mammal discoveries (by non-native man). They eat cacti and shoot stinky secretions from their butts. And they look funny. 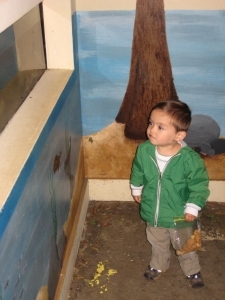 Our last animal exhibit for the day was the Rainforest Building. 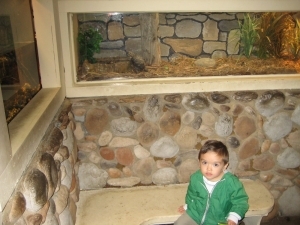 Despite being tired, this was Damian’s (and many other kids’) favorite spot at the zoo. 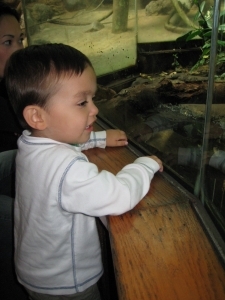 Filled with all sorts of small monkeys, tropical birds, amphibians and his favorite of all – an ocelot, Damian was in heaven. I don’t have all the names of the animals in there, but there were many. 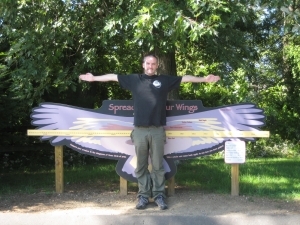 The birds flitted about above our heads as the monkeys screeched and flung themselves about. 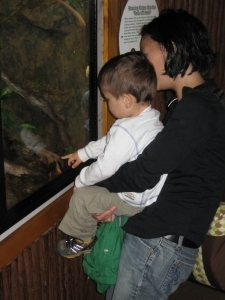 The little marmosets were a big hit of course. 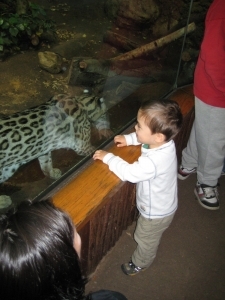 But it was the ocelot which captivated our son for an eternity. 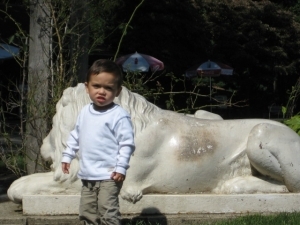 It was fun to watch his excitement each time the big cat wandered near. Again, I’ll stop yapping and share some pictures – even the bad ones. After all that fun, we stumbled upon the Beardsley Zoo Carousel Museum (CTMQ Visit Here) before strolling through the huge greenhouse on our way out. 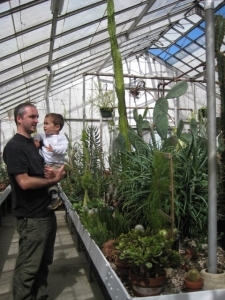 It is one of the largest greenhouses in Connecticut, with one half open to the public and the other half devoted to plant propagation for the Zoo’s many exhibit needs. On the public side, visitors enjoy a lush tropical section with banana trees, birds-of-paradise blooms, interesting cacti, fragrant orchids and many other interesting plant species. The Zoo’s propagation program grows plants for the Zoo’s many planting beds, wildflower areas, hummingbird and butterfly gardens as well as hardy specimens that are rotated through the Zoo’s animal exhibits. Monkeys swinging through trees and colorful birds clipping twigs for nests are enjoyed by our Zoo visitors, but those same animals create havoc for the Zoo’s horticultural staff! Plants that are badly pulled, chewed, and ripped out by our animals are routinely (and patiently!) 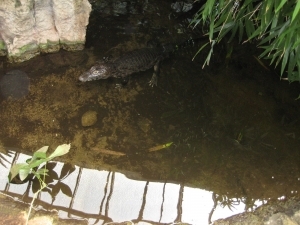 replaced by our staff and nursed back to health in the Zoo’s Greenhouse. 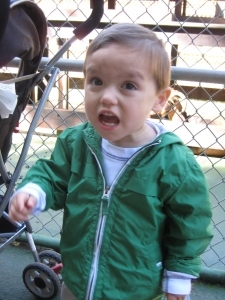 We used to be able to tell Damian to “relax” and he’d do this. And that, my friends, was that. 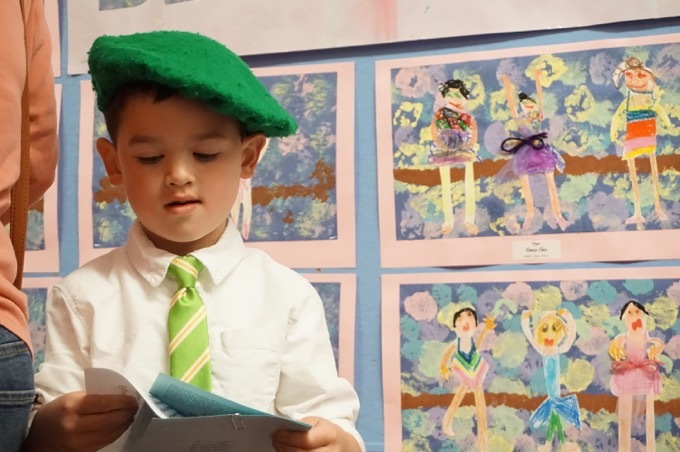 See, Bridgeport isn’t all crack dens and dilapidation – go check it out! Food & Drink? 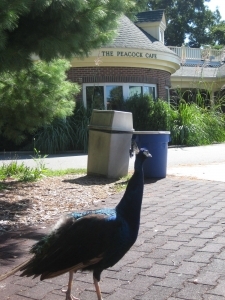 Picnic there or the Peacock Cafe! Hey-you were in our back yard more or less! One town up and you could have visited exciting Trumbull!! 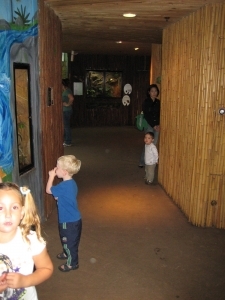 This is actually a very cute zoo-I took my kids when they were very young and visited again with a young friend of mine last summer. The carousel didn’t always used to be there-they renovated it from it’s original spot in Bridgeport and it’s a big hit there in that little zoo! 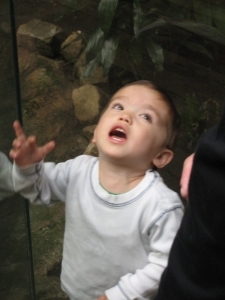 I’m interested in bringing my elderly and wheelchair-bound parents to your zoo. 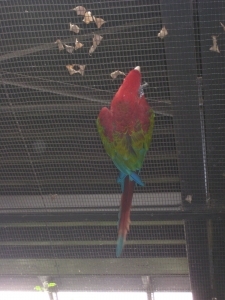 We are specifically looking for a butterfly house and also if you have an exotic bird house, such as hummingbirds. Do rent out wheelchairs for the day? 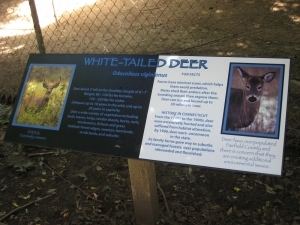 Just FYI, the zoo houses “common” animals such as white tailed deer and turkey vultures because there is no where for them to go. 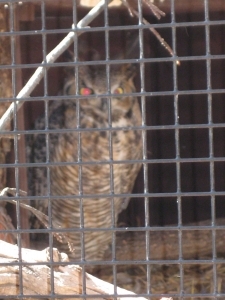 Humans have either injured these animals or removed them from their natural environment and they cannot be returned. 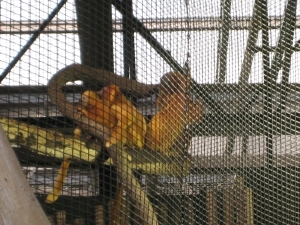 The zoo houses these animals as a favor to the DEP or USDA. 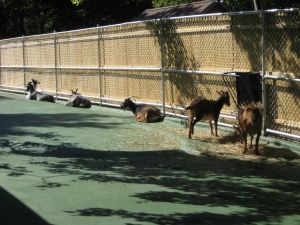 The goats are on asphalt so that the surface can be disinfected daily for their health. We are trying to prevent the spread of disease. 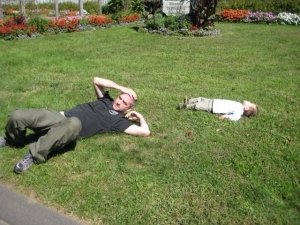 Thanks for visiting- I’m glad you and your family had an over all good time. 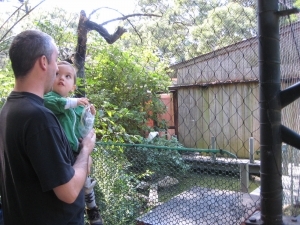 Yes, we very much enjoyed the zoo – I really do appreciate your answers to my questions in the post.